Who is Jonathan Budd and what is Powur? Just who is this Jonathan Budd and what in the world is Powur? If you have any type of interest in MLM companies, MLM reviews, or MLM news…then you have maybe heard talk of a new MLM company that is less than one week away from being launched. Today, we are going to take a look into Powur Solar and learn all about the mastermind behind this amazing concept that is sure to hit the ground running. Let’s see just who is this Jonathan Budd and how he came to create Powur. Jonathan Budd has been labeled as a master marketer and one of the youngest self made millionaires ever to come online. Young Jonathan came on the internet marketing scene at the ripe young age of 22 years old and started by working from his parents kitchen table! In just 15 very short months, he went from a complete noob on the internet to making thousands of dollars every single day. At the young age of 26 years old, he made $10 million dollars in direct sales and online marketing. He co-founded a company that went to 1 million people in 78 days! 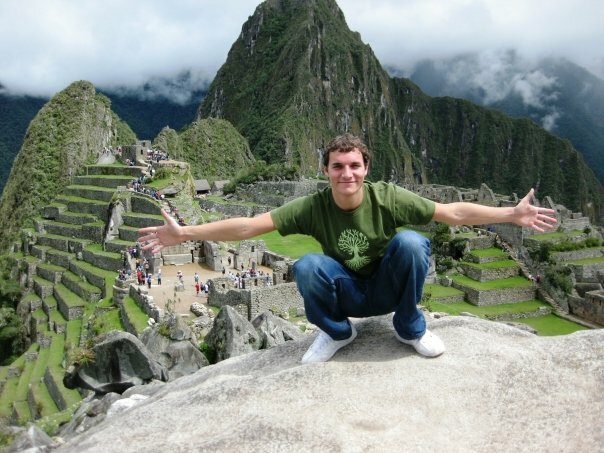 Jonathan then had a life changing adventure when he went down to the amazon rain forest that forever changed his life. More into that a little later. Jonathan Budd has had a special talent at spotting trends very early on before they become trends. He is able to see the future in a product or industry and run with before the masses catch on. One of those such products was Online Marketing Coaching. When he started, there were only 8 YouTube videos on the subject. He was the 9th! When you look at Online Marketing Coaches on YouTube today, they are flooded with tons and tons of videos on the subject. He is not only a visionary, but also a giver! He freely shares a lot of his secrets that has made him millions to anyone that wants it. Each of his products claims to help you build your own network marketing company by tapping into and harnessing the power of the internet to get it done. He has a laid back and easy approach when marketing his products. Not overly hypey or salesy, which I like. I personally can not speak for any of his products as I haven’t tried any, but AI did pick up on a pretty incredible little secret and tidbit while listening to one of his videos for free. What is Jonathan Budd doing now? At present, Jonathan Budd is the CEO of a new company Powur PBC. This new company has partnered up with one of the most iconic and powerful visionaries in the industry, Elon Musk and Solar City. Jonathan spent 22 months researching, perfecting, and creating Powur PBC in order to launch it out to the public on Oct. 17, 2015. This is potentially a huge shift in the way that we have done energy. Powur is a company that will help homeowners and businesses to adopt a clean energy solution by using solar power or clean energy instead of oil, coal, and gas or dirty energy. In our society today, we use so much electricity that we are actually leaving a carbon footprint that is detrimental to the biosphere of our planet earth. Powur will simply be a company that will use direct marketing strategies to deliver solar energy products to America with its objective of growing the demand for the clean energy that our world needs today and by creating a pool of business opportunities for entrepreneurs. This is at it’s very beginning and I believe could really take off once it gains the momentum and goes viral. Powur wants to disrupt and decentralize the energy industry. You may ask…what does that mean? Decentralize means to disrupt and disperse. It is the transfer of authority of power from a central source (the electric companies you pay every month) to a local source (you and I). To put it simply – Powur wants to take the $6 trillion dollars used in the energy industry today and put it back in the hands of their advocates and consumers. Much like what Uber did in the transportation industry, when they took everyday people, gave them an app to use, and allowed them to use their own vehicles to drive and make money. Powur is using technology to put the power back in the hands on the people and consumers that will allow them to get a piece of that humongous pie! For the last 22-24 months, Jonathan Budd and the Powur team have been working on a technological platform that will be used by consumers and advocates to share in this movement. The officially launch will be on Oct. 17, 2015 in La Jolla, California. This launch is shaping up to put into motion a platform that will allow citizens to mobilize (via smartphone app) renewable energy solutions that will allow them to create the new Clean Energy Grid. Not only will this make a difference in the wallets of millions, but it will get millions of homes to run on solar energy thus reducing the amount of a carbon footprint that we have been leaving. Put solar panels on over 2 million United States homes by 2025 thereby making a significant contribution towards reducing global climate change. Create a platform that allows individuals to participate in one of the most meaningful wealth transfers in the history of humanity, the shift from dirty energy to clean energy. This will undoubtedly start a chain reaction by building the largest group of consumers, homeowners, and peer to peer clean energy advocates so that Powur is able to facilitate the transfer of wealth from the largest industry to everyday people like you and I. So, you may be wondering how it is that you become a Powur advocate so that you can get a piece of that delectable pie. First, lets take a look at what a Powur Advocate is. 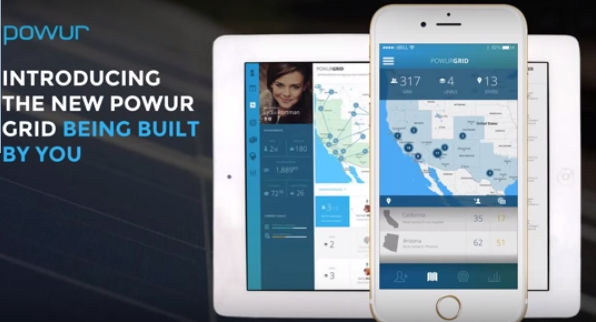 A Powur Advocate is someone that uses the Powur app to invite their friends and family to their power grid. The Powur Advocates are who the company will use to build the Clean Energy Grids. The goal of the Advocates to to assist in getting 2,000,000 US homes equipped with solar panels by 2025. Is that goal too lofty? I don’t think so, especially when you consider that there are 50,000,000 homes that currently qualify for the program. So why would a person do this? The concept is quite ingenious! The idea is to put millions of solar energy systems on the homes in order to save homeowners money on their electric bill as well as making a huge contribution to helping to reduce the carbon that is being released into the atmosphere every single day. So you are helping people to save money – that is a win! As a homeowner myself, I am more than happy to save on my electric bill monthly! Now – enter the virtual platform where these same homeowners, like myself, can create a home-based business and take part in the massive wealth transfer that will come from the world’s shift from dirty energy to clean energy! Powur estimates that $1,000,000,000 (that’s 1 TRILLION dollars) will be paid back to the Powur Advocates. Joining Powur is easy. You find someone that is an Advocate and they give you an invite code, then you join. It is completely free to join and start building your own Powur Grid but if you want further training, then it will cost you $199. For me – this is a WIN WIN scenario! You get paid to share the app, which is as easy as sharing any of your other favorite apps, and you get to make a difference in our world – the actually natural world. I haven’t gotten a personal invitation link yet to find out all the specifics, but I have seen that if you refer someone to have a solar system installed on their home, you are paid $250. The cool thing about the app that you use with Powur is that it lets you track EVERYTHING along the way and you know exactly how many have sold in your Power Grid and how much you will be making. Can I get Powur & Solar City for my Home? 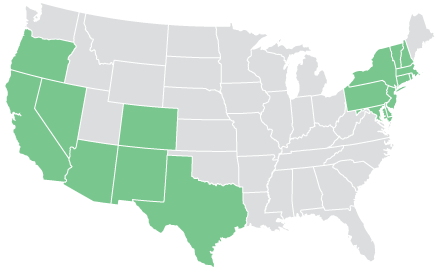 As of right now, they are only in about 15-18 states. 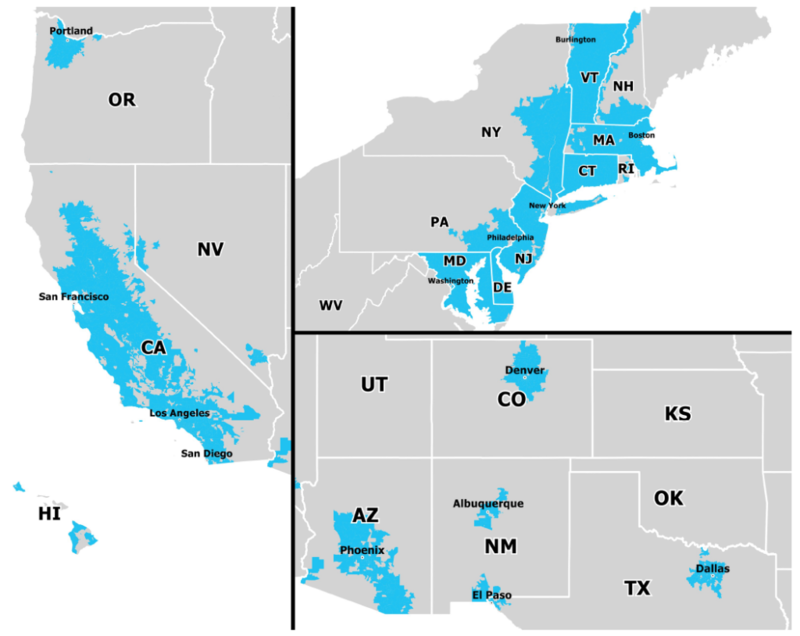 Most of the major Metropolitan areas. You can see the map below to see where they are. But I believe that once this thing goes viral, you will see exponential growth across the United States and expanding into lots of areas and eventually all of the United States with a long term goal of expanding into the world. SolarCity says that if you own your home and you pay at least $60 in your electric bill every month, then you qualify for a $0 down payment and a monthly payment that could be less than what you are already paying in your electric bill. Oh, and you have to have at least a 650 credit score in order to qualify. Recent statistics show that since 1971, traditional energy costs have RISEN by 500%. For example, if you were paying $60 a month in 1971, then you would now be paying $300 a month. Of course, we use more energy today to power ALL of our electronic devices such as computers, smartphones, tablets, tvs as well as our appliances like refrigerators, microwaves, air conditioner, coffee makers, toasters, and so on and so on. That is why the emissions of the carbon (dirty energy) released into the air has grown so much since the 1950’s. We are literally choking ourselves out with the technology that continues to grow that we just can seem to live without. Now when you look at clean energy like solar energy, you will see that the statistics show a decrease in cost of 250%. So if you are paying $300 a month in electric, then theoretically, just installing solar panels and switching to clean energy, will save you money every month. Some homes have even reported that they are able to sell their unused energy back to the power companies for their disbursement. Pretty cool, if you ask me! So, when you look at the staggering statistics of the ever rising cost of electricity, well, it doesn’t take a rocket scientist to figure out where this thing is heading and why it is a win win for homeowners. Staying with the dirty energy, we will continue to face a problem in the biosphere as well as continued price increases. Are people really making the switch? According to Solar City, a new home installs a solar system every 3 minutes! Jonathan Bunn looks like he may be have the Midas touch when it comes to online marketing and direct selling. Only time will tell with the new company. The product is solid, the partnering companies are top notch, and the idea has been proven with other companies like Uber, Airbnb, Etsy, Upwork, etc. with the technology platforms and the decentralization concept. I will definitely be keeping a close watch on this one!